Before you send your skater off to unsupervised skate parks, enroll them in our Skate Camp and let them attempt our ramps and rails with coaching. Our skate staff will teach them the proper way to jump, use a half pipe, ride a rail, or hit a grind box – and the importance of wearing all that protective gear. After making sure everyone has the basics down on Monday, our coaches and campers will walk to Zero Gravity skate park Tuesday through Friday so that campers get the opportunity to eally work on those sweet tricks! 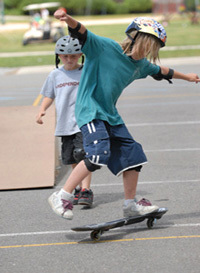 Throughout the week, campers will be challenged progressively on more and more difficult moves as their skills improve. On Friday of each week, we’ll be hosting an X-Games style competition. Campers are required to wear socks and shoes as well as provide their own full protective gear and need to bring their own skateboards.